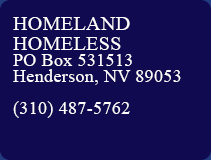 Homeland Homeless is a non-profit organization committed to assisting disabled and homeless veterans. This organization is also committed and dedicated to enhancing the lives of veterans and their families. Therefore, theorganization focuses on the education of all students. It is the belief of the organization that every child has the right to pursue his/her educational goals regardless of their financial status. Homeland Homeless issues scholarships to academically talented, and highly motivated graduating students. These students can attend a 4-year college/ university, a two-year college or, a technical/vocational school. Awards are based on academic performance, financial need, and demonstrated community involvement. All scholarships must be used in the academic year immediately following receipt of notification of acceptance to an educational institution or technical/vocational school. An official high school transcript with all current grades. 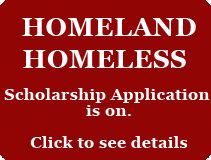 Scholarship recipients agree to the use of their names, pictures, and information contained in their application package for advertising and promotional purposes of Homeland Homeless, Inc.
All information must be emailed on the due date (May 30, 2017) in order to be considered for a scholarship award. Any application that is incomplete will not be considered. There will be no exceptions.